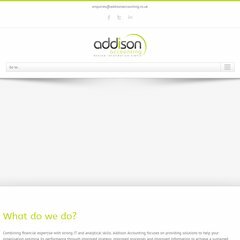 addisonaccounting.co.u.. Addison Accounting - Leicester Management Accountants, Process .. It is hosted by Fasthosts Internet Limited - Uk S Largest Web Hosting Company (England, Gloucester,) using Apache web server. ns2.streamlinedns.co.uk, and ns1.streamlinedns.co.uk are its DNS Nameservers. Addisonaccounting.co.uk's IP address is 213.171.218.196.